News media possess an orchestrating, manipulating power over the public debate; they create the framework in which we discuss events and learn about ourselves and our surroundings. At the same time, news products provide much of our foundation for knowing about the world we inhabit. However, we lack empirical knowledge about the process of writing news texts, i.e. knowledge about the choices made by journalists as to what to communicate and how to communicate it, in other words, the decisions they make as regards content and linguistic form, respectively. Revisions made during writing yield insights into the progression of a text, providing a signficant element to the understanding of how journalists juggle content and form in their mediation of knowledge. Thus, (NN 2016) of journalists’ revision activity when producing a text. The study was designed as a multiple case study and explored different aspects of revisions occurring during three specific instances of professional text producers’ ordinary writing practices as they unfolded in their natural setting in an editorial office of a major Spanish newspaper. Placing the research agenda at the center and with a view to presenting a description as comprehensive as possible of the revisions made during the writing processes, the study applied a mix of qualitative and quantitative methods, i.e. keystroke logging, participant observation and retrospective interviews. For each journalist, the study investigated the characteristics of the revisions of content and form separately. In this sense, the study examined time of occurrence during the writing process, revision type, such as addition, omission and substitution and the possible relation between timing and revision type. Moreover, the study analysed the distribution of revisions between content and form and the differences between and similarities shared by the three journalists. To operationalise the content-form dichotomy, the analysis builds on Faigley/Witte’s (1981) taxonomy. Accordingly, content revisions add new content or omit existing content that cannot otherwise be inferred from the extant text. By contrast, revisions that only affect the form of the text neither omit nor substitute original content that cannot be inferred from the extant text as it is, nor do they add content that cannot already be inferred. When tracking the text production process as it unfolds in computer-based writing, the continuous revisions made as part of the ongoing text production process become visible to the researcher. At any given point during writing, the written text can be revised at its leading edge, where new text is being transcribed, and in the text already written, i.e. after the text has been transcribed. This distinction between revisions according to their location, i.e. in the text currently being transcribed (pre-contextual revision) or in the text already transcribed (contextual revision) is relevant when the effect of a revision (content or form) is to be interpreted; generally, only the effect of contextual revisions is interpretable on the basis of keystroke logging alone. The approach to the analysis of revisions was inspired by the online revision taxonomy developed by Lindgren/Sullivan (2006a, 2006b) in collaboration with Stevenson/Schoonen/de Glopper (2006). However, the taxonomy proved to be insufficiently accurate to be operationalised, and too coarse to categorise all interpretable revisions in the data. Consequently, a stringent and nuanced analytical framework was developed based on existing theory and the data. This framework places the revisions made during text production on a continuum of semantically meaningful context. At one end of the continuum lies the potentially most complete semantically meaningful context represented by a sentence concluded by a sentence-completing character, and at the other end, the semantically non-meaningful context. In between the two ends, the continuum holds semantically meaningful contexts that are potentially less complete, such as semantically meaningful sentences without sentence-completing characters and semantically meaningful phrases. By introducing an interpretation as to whether a revision is conducted in a semantically meaningful context, the analytical framework distances itself from a more objective categorisation of the location of revisions at the leading edge or in the transcribed text. This allows for a systematisation of the contexts in which the effect of revisions at the leading edge can be interpreted and the contexts in which the effect of revisions made in already transcribed text cannot be interpreted. The exploratory and qualitative nature of the study provided a detailed analysis of the journalists’ revision activities, and it offered nuanced insights into their text production. The results showed a relatively homogenous picture, including certain variations, in which the form of the text was revised significantly more often than the content, both during the ongoing text production and, in particular, during the systematic review of the potentially final text in which content was only infrequently revised. Revision types and their effect on the text during the ongoing text production and in the systematic review of the potentially finalised text reflect the diverging purposes of these two phases: the first phase serves to generate cohesive and coherent text for the article, and the second phase aims to evaluate and, especially, to reduce the volume of the written text. 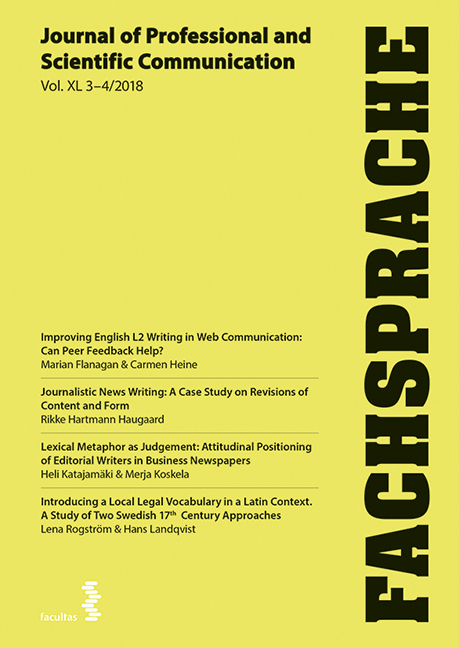 The overall tendency of the analyses and the details which it reflects can be used as the basis for new studies and can help generate hypotheses about how other text producers, both in similar and different contexts, write and revise theirs texts and how they juggle content and form in their democratisation of knowledge. Haugaard, Rikke. 2018. Journalistic News Writing. Fachsprache 40 (3-4), 122-40. https://doi.org/10.24989/fs.v50i3-4.1517.